Blizzard has announced plans to introduce some long-awaited features to StarCraft II ahead of (or alongside) its first expansion, Heart of the Swarm, which is expected sometime this year. Arguably the most interesting addition is the ability to resume multiplayer games from a replay file. Because StarCraft II requires the Internet, many games have been ruined when connections are lost to Battle.net. This is especially troublesome when money is on the line at tournaments. Players have been begging for a solution since 2010, so the resume function is greatly welcomed. The new replay system will also allow multiple people to view the same file, a feature present in the original StarCraft, but still missing from its sequel. Besides the obvious benefits of multiplayer replays, the feature should make life easier on casting teams who commentate on pro replays. As announced for Diablo III, StarCraft II will soon support Global Play. Users are currently restricted to their region, preventing them from playing with friends abroad without buying a separate copy of the game. This will no longer be the case. Likewise, the game will receive multilanguage support. Blizzard promises new features for clans, though it doesn't cite specifics beyond calling it a "clan/group system." The company also vows to add unranked matchmaking, so you'll be able to experiment with new build orders or practice with an off-race without decimating your ladder ranking. 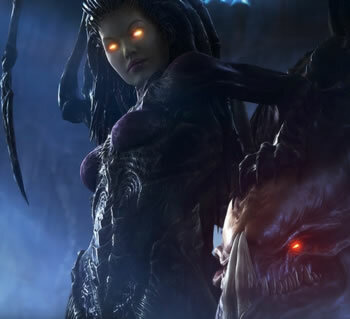 "It's shaping up to be an amazing year for StarCraft II," the developer wrote. Along with new features, Blizzard noted various other happenings, including a Heart of the Swarm preview at MLG Anaheim on June 8-10, an opportunity to gain HotS beta access, and a new StarCraft II magazine.